Before being able to borrow books from the library you will need to fill the Library Membership Forms which are available at the ‘Reference Desk’. Kindly fill-up the Membership Form and submit on the Circulation Desk. Please remember to complete all required information including the contact information and e-mail address so that you may be informed of the activation of your membership as well as the borrowing rights. Books may be borrowed by the Registered Library Members only. The FCC Identity Cards bear the Library Registration Number Bar Code. For borrowing library materials, the patrons should present their University ID Card at the Circulation Desk along with the Books to be borrowed from the Library. Please do not forget to obtain a receipt for the Check-in or check out activity, before leaving the circulation Desk. Borrowing Privileges are strictly not transferable. Borrowing books on someone else’s card is not permissible. Borrowing rights vary according to the users’ categories and the type of material being borrowed. Currently we follow the following pattern. Reference and rare books and periodicals do not circulate except for weekends and over night. Users may also place a hold request on any item issued to some other member. Please contact Circulation Desk or Reference Desk for placing an item on Hold. The Books can be put on hold both from Circulation Desk or Online. 4. 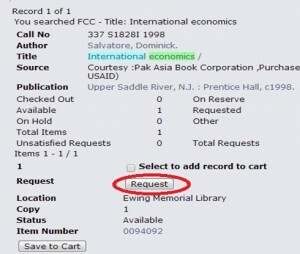 Find the required book and click on “Request” button. 5. Click “Submit” for submission of your request. 6. Book will be successfully hold for 24hours. 7. The Due Time can also be viewed by clicking on “Summary” on the right side or by logging in again. 1. Rupees 10/per day/per volume will be charged if the books are not returned on the due date. 2. 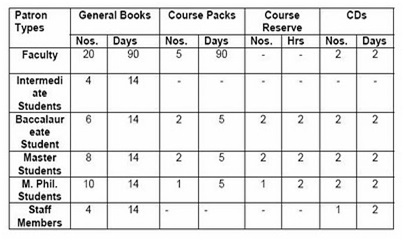 Rupees 100/per day/per volume will be charged if the Course pack are not returned on the due date. 3. Leave from the College does not exempt a borrower from overdue fine. 4. Books returned through mail must be sent under a registered cover to the attention of Chief Librarians. If a loaned book is lost, defaced or damaged, the borrower will be required to replace the book or pay for the damages. Such cases should be immediately reported to the Library to avoid accumulation of overdue fines.